One of my first concerns when watching a movie based on a book I have read is to worry what has been left out. No matter how faithfully adapted there are always some things that fall by the wayside in favor of the cinematic need to fit a grand story into something that can be viewed in one sitting. Then there are the things that are altered for much the same reason, or to meet the visions of the screenwriter and director. The actors chosen also bring their own presence to the characters. Knowing all this it is still difficult not to get excited about seeing a favorite story brought to life. As part of the Pride and Prejudice Bicentenary challenge 2013 hosted by Austenprose I elected to watch the 2005 movie Pride and Prejudice staring Keira Knightley and Matthew Macfadyen, which I had not previously seen. 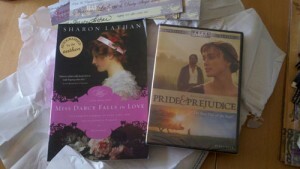 My plan had been to borrow it from a friend, but in a stroke of serendipity I won a copy along with an autographed copy of Miss Darcy Falls in Love as part of the Hearts Through History Valentine Blog Hop from author Sharon Lathan. Of course that meant I watched it before April. In fact, I have watched it several times since then, along with all the special features. Now having seen both the 2005 movie and the 1995 BBC mini-series I suppose the first thing anyone really wants to know is where I stand on the Matthew Macfadyen vs. Colin Firth as Mr. Darcy debate, as if no other portrayal of Darcy is worth considering. I suppose among some, that is indeed the case. I am not sure how to choose. They are so very different because the movies are so very different. Everything seems more intimate, the characters more vulnerable in the 2005 version. The Bennet family is more affectionately portrayed, with the silliness and absurdities more endearing than completely mortifying. They are embarrassing, but still a loving family in a way that I did not see before. I particularly loved Donald Sutherland’s portrayal of Mr. Bennet making him more loving as both a father and husband. This in turn makes Brenda Blethyn’s Mrs. Bennet a truly devoted mother, though she clearly says more than she should without considering how counter intuitive her profusions are in her efforts to see her daughters married well. Upon my first viewing I was struck with how dark and grey many of the scenes are. This became particularly interesting to me after watching the movie again with the director commentary on as Joe Wright mentions Jane Austen’s own concerns of Pride and Prejudice being “too light & bright & sparkling,” and how he added the shades particularly to lessen that. For all that had been written out and altered, I think, something very special was added with those shades, both the visual and emotional shades. While I would not say that this is in anyway the definitive cinematic version of Pride and Prejudice, it is my favorite. I would recommend the 1995 BBC mini-series with Colin Firth and Jennifer Ehle for those who would prefer a more faithful adaptation–bare in mind I have not seen the 1980 BBC mini-series staring David Rintoul and Elizabeth Garvie to factor that into my recommendation. Perhaps someone else might weigh in on that. Oh, back to the Colin Firth vs. Matthew Macfadyen debate. How can one chose between to very compelling versions of the same man? I found both men equally attractive, though Macfayden’s Darcy seemed more approachable to me. In a way I would say that Firth was more Mr. Darcy and Macfayden was an alter universe version of Mr. Darcy. In saying that I suppose it all comes down whether or not I am a purist, which I am not. I love the original, but delight in the many versions and interpretations. Still, can I just love them both? Is that allowed? Well, I’m doing it. So there. What about you?